It had to happen one day I suppose! As has already been mentioned via the agility forum my lovely Fleet went Grade 6 - I will try and take a photo of the trophy as its really quite unusual but the crystal kind of blocks just flash back at me when I take a photo of them! The lovely Dave and Viv Robinson asked me to go and judge at Waldridge Fell and kindly said we could go early and stay longer so that made it worth taking a little holidy as its a loooong way to the take the caravan, so when people have asked did I go there to try and qualify for the KC Novice I was like ermmmm no I came here to judge on the other day and did not even request which day just said I did not mind what day I judged. I have to admit that Fleet and I have not had it very together for a while but we always forgave each other and he always came out grinning and tugging on his lead - I think I kind of got into sync more with Cadders and also with training Kaiser as well Fleet does not even attend a class now. We seemed to get more into sync at Shrewsbury and he did some lovely runs the best of which was holding the lead in G5 Agility for a while (with me biting my finger nails saying noooooo!) and we ended up 3rd phew! At Tunbridge I did a nice controlled round with controlled stops and waits on the contacts in the KC Novice on quite a straightforward course and we were 3 secs behind the winner coming 18th and I knew that was all time spent on the contacts - since it was brought in this was one class like many people I would like to do well in - only trouble is that doing well could mean a little too well and I just did not think the combination of Fleet and I were G6 material - he did win 8 Novice Jumpings under the old system but for some strange reason G5 courses started out as something like G8 more often than not and it really dented our confidence (pull through after pull through!) - he did win a G5 Jumping at Tunbridge last year and if he had won 2 more jumpings then so be it but I did say that the KC Novice was the only Agility Class I would want him to win and actualy running the little Cadbury dude in the 6/7 classes has given me a bit more confidence and I have been trying to run a little faster! So I watched some lovely runs at Waldridge and thought I could not touch them for time and thought "hey I will go for it and see what kind of place I could get" so the result was 1st - mixed emotions but I am very proud of Fleet and he has taught me a huge amount and hey we get to go to the KC Novice Olympia Semis in September. Dennis kindly got the run on video (well apart from the bit's where he lost Fleet or I - chuckle!) and I really don't remember teaching Fleet a running dog walk contact!! In G6 what will be will be - he is my first large dog to get to Senior/G6 and I am proud of him! Sorry I have not had much time or inspiration to blog - I do enjoy reading all the blogs so please keep blogging! Oh dear I am a baaaaaad blogger! I do like to read everyone else's when I get a moment tho! I have been enjoying being back at shows and Cad has been being a little star even surprising me - I kind of thought he would never get placed in 6-7 combined - and he has now had a few places and these are not little shows either! One was on the course talked about on Nancy's blog at WBSDS - phew that was a hard one for my brain - I was pleased to get 3rd (behind 2 Grade 7 BC's) but funny I was even more pleased to get 3rd in the 6-7 Jumping on the same day that the lovely Don Curtis judged as it had some handling areas but also some blasty bits too. Kaiser's training has been going ok - sorry no video - although a couple of his siblings came out a few days after their 18 month birthday I have not entered Kaiser as I knew he was not ready and did not want to a. feel I should run him and allow bad habit's to develop and b. undo the good work I am trying to put in and c. I don't want him to catch sight of the dog in the next ring running and dash off to herd it - he won't hurt the dog but could scare it and I would hate that and also would hate for him to ruin someones good round! So I am leaving him for a few more months and will see how training goes. I know 18 months is when everyone wants their dog in the ring but for me there is plenty of time and there is no great hurry really. He really is such a lovely dog - we have goony moments between us sometimes in agility but actually I really don't care!! Little Jaf has had awful problems with his eyes - he does not produce tears and it has affected his eyesight - there is an Op but it hardly ever works and is such a lot to put him through - he is trying some more eye stuff but the Vet is not sure it will work - I do feel for the little chap as it can't be nice for him :( Foggy is fine - coming up 12 and barky and sweet as ever! A photo of Jaf and Fog together - they have always got on really well and both were younger in this photo! Ok I got tagged by a couple of people - see I do still read the blogs I just have not had the enthusiasm to update my own! So this was the photo that came up by following the instructions - Cad as a puppy! Yes I know he looked like a poodle there but I like how he looks now - it's all part of his character! Ok so where have I been and what have I been up to since I last blogged - loads of dull personal life stuff to sort out which is just too dull to blog about but also some much nicer personal stuff too which has kept me focussed and while blogging I would just like to say a huge thanks to the friends who have been there for me in recent times - you know who you are and I really do appreciate it :) Now all I need to do is sell two houses and buy another before the agility seasons starts - haha yeah right like that is going to happen! Ok onto the Agility, November saw 3 shows - North Downs - just classes for Fleet there and I was everso busy helping so no clears but as ever he was a good boy :) Then the next day down to Devon for a couple of days - I like to go to Dartmoor show and combine it with a visit to my Mum so thats what me and the dogs did - it's only 2 runs but there is a nice warm cafe and loads of people to chat to - and again no clears for Fleet - I seem a bit more in tune with Cads these days and actually I don't very often train Fleet and only train Cad once a week - Cads was a little star bless him - he won the Medium Combined 4-7 Agility which gave him his 2nd win towards Grade 7 and also came 3rd in Medium Combined 4-7 Jumping. Had a lovely time visting my Mum but boy where there some floods when I was driving home......lucky the van is quite high up as one flooded road I had to drive through the water was rather high! Went and saw James Bond just after that too - I do rather have a soft spot for Daniel Craig - chuckle! Newton Heath is a nice show but a looooong way! I really do find indoor shows so much more social - a load of us sat on the wall and just chatted loads and watched agaility - Fab! Now a little theme is developing here.....no clears for Fleet !! I blame the handler! Cads was a good boy - just one clear but came 3rd in Medium Graded 5-7 Jumping. The Agility Club AGM - I have not taken a photo of Cadbury with his trophy for winning the Medium Grade 5 Section - really I must it's such a stunning trophy - Virginia put one in the Voice - nice photo of Cad and the trophy but I looked weird sort of insane grin! (no please don't go back to the Agility Voice and have another look!) a few of us went out for a meal after - which was yummy! Then Christmas came and went - I worked at Christmas - yep even Christmas Day.....well someone has to take 999 calls even that day of the year and I prefer to let people with little kids be off work and I take my time off in the summer! Just after Christmas we went for a walk with 30 dogs (and I think 8 people!) and then a nice meal - then I got the flu lurgeee thing and then a chest infection - deep joy! Only entered one show in January and that was Wilmslow - always a nice show and back "oop norf" at Myerscough - the theme for Fleet contined....no clears but he did some nice bits - Cad was a god boy - I pulled him off the side of the dog walk in the KC Medium - bad handler! He came 2nd in Medium Graded 6-7 Agility so was really pleased about that. Have been having fun training Kaiser, he is a real challenge but actually I find when I have to work very hard to achieve something it does make it more worthwhile.........in the end! Went for a lovely meal with friends the other day - mentioning this as the pub had a funny name it was called "The Golden Retriever" !! Think I am up to date now, apologies for lack of updates - everyone keep blogging as I do like to read the blogs and I will try and pop back and update when I have the inspiration! Thought I would pop back and put a little update on the blog...I say little and then the keyboard will run away with me...! I keep reading everyone elses blogs and for various reasons have not updated my own....bad bad blogger! KC Fest - enjoyed judging and competed with Cad, Fleet and also some runs with Joyce Hazel's little tri BC Jovi - if my memory is right I think the only place I got was with Jovi - a 5th with a messy clear. 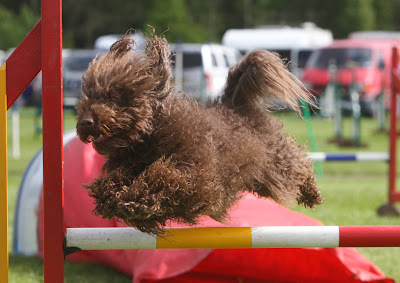 Dashin Dogs - judged there too - and only competed for 2 days - Cads won his last Grade 5 Agility and got a 2nd in Jumping. Summer at Ely - got a few places here - Cad came 1st in TYOL, also popped (haha) up to the Dog Vegas Final with Fleet - he got E-d at a really tricky part but was pleased with how he ran the rest. Letchworth - did 2 days at this show and got a few places - including a 2nd with Joyce's Jovi. Bromsgrove - again a show I really like - got a few places here including a 7th with JaiJai which I was really pleased about as he does not go clear very often! Lune Valley - just a small trip mmmm a lovely show and venue though (indoors yay I like indoor shows!) Cad got a 2nd in 6/7 Combined Agility so well pleased with that place and I got a few other places too. Downland - just recently judged at Downland in the morning and enjoyed that and then had a nice time chatting to people and watching agility in the afternoon! Phew that's up to date I think - sorry it's just a list but did not want to make it war and peace! I do have a photo of Cad in the DIN Final - I must scan that as it's a nice one. Ok having a rest from packing as off to the KC festival in a little while - am on a little tour - Roger does the start and the end as he has to come back for work. Right quick re-cap - I have had mixed emotions about updating - someone at a show took the $%£& and said that Blogs were just somewhere that people bragged.....and I knew my next posting was about my little fluffy star going Grade 6........Sue put well done on the forum and so many people said well done and that was really sweet. I love all the blogs - photos, courses, videos and reading about what all our agility friends have got up to so I will still Blog and if my dogs do ok I will put it in the Blog and if anyone does not like that well don't read the Blogs !!! Ok Lune and Barrow - I had fingers crossed for nice weather but it did not really work - we had a good break even though the weather could have been nicer - at least it was a "proper" showground so when it rained there were roadways and the ground drained well. I judged the first day - Large 1-2 Agility - I did not know that many of the people in the class but it was still enjoyable and an Fab Springer Spaniel won the class :) Then I had Small 1-7 Jumping - Bernadette and Hex won this class - then it was Lazer Pairs with Carlos as the other judge ....mmm well some of the people seemed a bit dippy and did not even understand "indicate to show you are ready" so through the wind and rain we got there in the end! I had decided that I would just run Cadbury how I know he can and see what happens - if he went Grade 6 then so be it....that's not bragging honest and I do know that the standard of Mediums at Grade 6 and 7 is a real different ball game. He already had 2 jumping wins so a jumping or an agility would move us up. Well he got a 2nd in 4/5 Jumping and then a 2nd in Graded 1-7 Agility and a 7th in 4-7 Combined Agility (Dave Hutchinsons course that Bernadette talked about on her blog with the tunnel under the dog walk), then we got the win - a 1st in Graded 1-7 Agility - bless him he did a lovely run and the judge was Michael Bye who always sets nice courses (no I am not just saying that cos I won!!). 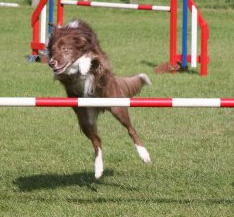 Fleet had a week of 5-fault-itis - and only one decent clear a 6th in Grade 5 Agility. Ripley had great fun in the Veterans and got some great places. Roger got a 3rd, 4th and 6th with JaiJai - wow thats good for them they don't go clear very often! Josie had a 9th. Next stop Newlands Show.....well this was one of the things that took up a lot of my time and prevented me from Blogging (yes I know I nip on and off the forum but Blogging takes memory and brainpower!) I was the Show Sec for the first time and also somehow kept all the jobs I did in previous years hmmmmm! To say I was proud that my dogs worked ok is an understatement as I really felt they got so little of my time - Cad got 1st in 4-5 Agility, 2nd in 3-5 Jumping and 3rd in 4-5 Jumping yay gooo fluffy! Fleet had 3 clears bl;ess him but messy in all of them....this was probably as I was trying to rush and he and I get flustered - the blips put us out of the places in the jumping but he got 12th in the Grade 5 Agility. Now this next one seemed a good idea but I was cream crackered! I had entered Chipping Norton the day after Newlands - actually it was very relaxing - 4 rings and run by nice people - one funny incident with a judge who had a paddy (not with me!) and there was lots of time to watch other peoples runs while sitting around the rings. Cad was an angel - he had a very hard 1-7 Agility and he got to number 16 clear and then jumped it the wrong way (it was hard!) and missed a pull through int he jumping and did get one place a 9th in Jump and Go - weird class - a time jumping course that if you are clear you get to do the untimed agility. Fleet got 9th in 4/5 Agility and Rip got 7th in a tricky Anysize. Really I should add some photos......as all this text must be getting dull......I did take a few on my phone in the Lake District.....but have not downloaded them yet! Next Stop Derby Show - Fleet was in the Adams Derby Final (Novice Power and Speed) and I also I hate Newbury so off to Melton Mowbray we went - OMG it was soooooooooooo hot! I think the hottest I have ever been at a show! Fleet was ok in his final - got round the agility bit ok but then took the wrong jump in the jumping - the jumping is normally speedy but it was quite a handling course with a tricky weave entry - Pat Brown won and made it look easy! Roger was at work on the Saturday so I could to run his dogs - there was a heat of the Adamsn Derby and I got all 3 dogs onto the power bit so was pleased about that - only one clear int he jumping was Fleet and he was running NFC ! 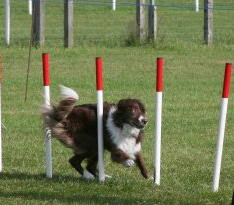 JaiJai did a fab 4-5 Graded Agility with just one pole - there were only a few clears and he came 5th! Fleet got 9th in the Novice KC and 9th in 4-5 Jumping. Cad was running well despite the heat (not sure about me!) 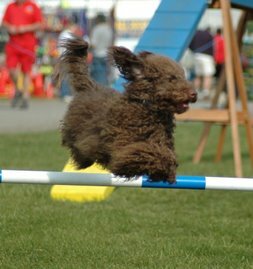 and was doing a lovely agility and then just had a run-by - he had a coupel fo jumping courses that were almost 4 straight lines - bless him he tried but he does not have the length of leg or turn of speed to compete against the bigger dogs on these kind of courses. He did a lovely run a 4-5 Jumping and I watched others go and was very surprised that we came 1st - I thought they looked quicker than us and the course had a few bits to work but no majoyr traps as such. Rip got 3rd and 4th in the Anysize again and Fog also got a place (10th). Yay nearly up to date now....! Next stop Burridge -a show on a Friday - weird! Friday is my day to ty and catch up on stuff at hoem but this show was sooo local - 20 mins down the road! One ring and very laid back - I only had two runs with Fleet - no places but he did some nice bits. Roger had taken the day off to go and he got no clears :( ! Back to Burridge on my own on Saturday as Roger was at work - Cads missed the weave entry in the 1-5 Agility - he went to the number - he has never done that before! Went clear in the KC Medium but with some very good dogs there he was just out of the places. Our friend Joyce was in hospital (is out now) so she had very kindly said that I could do a couple of runs with her speedy medium collie Jovi - that dog is awesome! I had run Jovi once at training a few weeks back but only over 5 things so were did our best but we not used to each other - her best run was 1-5 agility with just a missed weave entry (as Cad did that too it must be me!). Fleet did pairs with Matt and Buddy and I was very proud that they came 6th. oooo nearly there.......on Sunday we went to Aylesbury. The ground was rather bumpy and the weather a bit pants too! Bless him I think the ground did affect little Cad as he is not a pole knocker and whizzed round two courses only to have one pole in each. His last run was in a ring where I think the ground was a bit more even and he got a 2nd in Jumping (3-5 Graded). Rip won the Anysize Jumping - bless him it was an interesting course and he whizzed round it! Foggy came 10th. Roger did two runs each with Josie and JiaJai with no clears and I think he was then determined to go clear and got them both clear round 4-5 Graded Agility - JaiJai did what I think was the best round ever and came 2nd - the dog that won is a brilliant dog already Grade 5 and Josie a little behind JaiJai on time but still clear and came 3rd :) No places for Fleet and he did slip on a corner on one run so I checked him and came out - luckily he seems fine. Right that is me all caugh up sorrreeeee for being so bad at updating and sorrree that there is no photos. 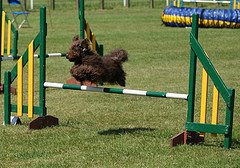 Now off on an Agility Tour so will promise to try and update more often when I get back! I am the baddest Blogger! Ok not quite but I have been sooo bad at updating recently......various reasons really, been very busy at work as I have been working on a project, then I am Show Sec for Newlands Show which is this Saturday, making sure I spend enough time with the dogs etc etc! I will do a little recap....Axstane...nothing that exciting to report from here - Cad only had one class as a Grade 5 where he was not competing against G6/7's not really sure thats very fair....saying that the one run he had just aganst 5's was 5-7 Graded and we threw that as if I wanted to do the KC Fest Novice thing (which I know I will balls up now!) then he had to stay in G5 for that weekend. A nice lady with a little Pap had asked me to do Mini/Mixi with her with Cad and they actually make a very sweet pair - they came 14th so that was cool - it was just bizarre running Cad on a course that had small and medium jumps very near each other and I was proud to stop him doing any small jumps! Well I went to Wyre and Roger went to Thames !! Last year we both went to Wyre as Rip was in the Veteran Jumping Final (he came 2nd in it bless him) and we both thought it was a lovely show in a idylic part of the country so I wanted to go again and as I don't work on Friday I could spend Friday travelling up. Roger sort of (haha!) works on Friday and also he had to work on the Saturday so really it was way too far for him to drive up after work on the Saturday so....Sue, Duessa and I stayed at a posh BnB. At Thames Roger had entered 3 classes on the Saturday in case he got finished work early - he did get there in time to do one class but it was a hard course for JaiJai (he tells me!) and he got E-d. On the Sunday he was paired up with a French lady who was coming over from France for the weekend - Josie was with her Merle collie and they came 17th in the Chum Pairs and also Roger got a 9th in Grade 4 Jumping with Josie. Fleet only had one clear and he got 6th in 3-5 combined Jumping - he seemed to have 5-fault-itis! Rip did a lovely run in Veteran Jumping and came 5th. I had got this far into the year with Cads and he was still Grade 5 so I had two more weeks to stay in Grade 5 if I wanted to compete at DIN and the KC Festival as a "Novice" so this was what I decided I wanted to do - have fun but not worry too much about places - bless him with a very held dog walk contact he came 3rd in Medium 4-5 Agility and worked well in his other classes. We had a Medium 1-7 Jumping and I quite liked the course it had the course and thought it would be fun to try out a few things that I would do in training but perhaps not be brave enough to do in the ring - Cad whizzed round and then Sue told me I was in the lead??? Bug would have of course beaten Cad but she had a pole down, Nooooooo I can't be in the lead in 1-7 (Cads needs either one jumping or one agility to take him to Grade 6......) class closing in 2 mins.....2 more dogs appeared one a collie that I know is not at all speedy and a black terrier I did not know - well thankfully the black terrier (a lovely dog I now know is called Morph - what a cool name!) beat us and I was very pleased to come 2nd.